Must. Resist. Temptation. To. Order. 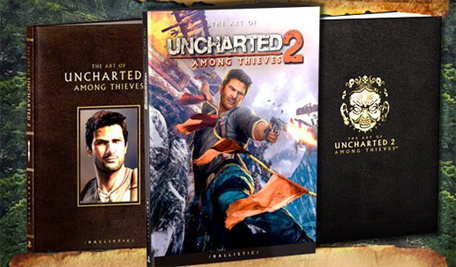 Realising that Uncharted 2: Among Thieves deserves to be more than a flimsy glossy pamphlet, Naughty Dog's teamed up with Ballistic Publishing to release this high-quality publication pertaining to the game's "concept art ... character studies, environment art, character modeling, game art, cinematics, motion-capture, animation, and effects". The book's available in three different permutations: a soft-cover print for $65.00, a leather-bound "special edition" which costs $129.99, and a $300 Limited Folio Edition, which is embossed in gold. We're so close to pressing the pre-order button, but we know we have to hold strong. Hold... Strong.